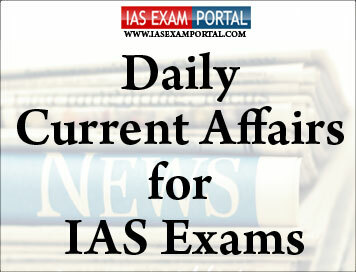 Current Affairs for IAS Exams - 22 JANUARY 2019 | IAS EXAM PORTAL - India's Largest Community for UPSC Exam Aspirants. Ahead of the 2019 election, the Rural Development Ministry has proposead that the monthly pensions of the elderly poor, disabled and widows be increased from the current ₹200 to ₹800. For those above the age of 80, the proposal is to increase the pension from ₹500 to ₹1,200 a month. The Centre has been considering various welfare measures to benefit rural Indians and farming communities before the LokSabha election. Senior government officials have mentioned income support, interest waivers and increased access to credit as some of the other measures being considered. The NSAP is a Centrally Sponsored Scheme with an annual budget of ₹9975 crore. It currently covers more than three crore people who are below the poverty line (BPL), including about 80 lakh widows, 10 lakh disabled and 2.2 crore elderly. In spite of a ban on the import of plastic waste into India, the influx of PET bottles has quadrupled from 2017 to 2018 thanks to legal loophole, says a Delhi-based environmentalist organisation, PanditDeendayalUpadhyaySmritiManch (PDUSM). A senior Union environment ministry official, who declined to be identified, told that while the ministry couldn’t vouch for whether such plastic imports had quadrupled, it was true that the imports had “substantially increased” and action was being contemplated. The analysis found that between the financial years 2012-13 and 2016-17, Gujarat, Madhya Pradesh and Karnataka were the fastest growing states, on average. While all three managed to maintain their GSDP growth higher than the all-India GDP growth in 2018, only Gujarat remained in the top three. Madhya Pradesh and Karnataka both saw their rankings slip to 9 and 4, respectively. The States at the bottom, similarly, saw a reversal of fortunes. West Bengal, Jharkhand and Bihar had ranked at the bottom in the past five years. In financial year 2017-18, however, Bihar rose to the top spot and West Bengal rose to the sixth rank, with a growth of 9.1%, significantly stronger than the national GDP growth rate. Jharkhand, however, remained at the bottom. “A larger impact is expected on fiscal and revenue deficit to gross state domestic product ratios for Madhya Pradesh, Kerala and Rajasthan, among non-special category States, in FY20,” the report said. The government, which had a majority stake in the bank, started the process to sell a part of its stake to LIC, which is also owned by the government, in June last year. The bank’s board has now approved reclassification of LIC as promoter of IDBI Bank. IDBI Bank shares closed at ₹56.50, down 3.17% from its previous close. “The deal is envisaged as a win-win situation for both IDBI Bank and LIC with an opportunity to create enormous value for shareholders, customers and employees of both entities through mutual synergies,” the bank said. The over 1,800 branches of IDBI Bank will be be used by LIC to sell insurance policies. “IDBI Bank and LIC have started working to ensure full realisation of their synergies over the next 12 months. Improved financial health will pave the way for the bank to exit from PCA in a time bound manner and be a future-ready, top-ranked bank,” the bank said. Following the stake acquisition by the LIC, IDBI Bank has re-initiated divestment process of its stake in IDBI Federal Life Insurance Co. the bank said. Indian and Pakistani officials are expected to meet next month to discuss a “draft agreement” on the Kartarpur corridor in Punjab, sources confirmed. The meeting follows the Pakistan government’s announcement that it had shared the draft of the agreement, to be signed by the two governments. Among the issues that need to be finalised are the exact point of crossing over for the pilgrims, the identity cards required, as well as security procedures and guarantees needed by both sides. Growing signs of weakness in China which has generated nearly a third of global growth in recent years are fueling anxiety about risks to the world economy and are weighing on profits for firms ranging from Apple to big carmakers. With support measures expected to take some time to kick in, most analysts believe conditions are likely to get worse before they get better, and see a further slowing to 6.3% this year. Nirmal U. Kulkarni, a herpetologist and conservationist from MhadeiReseach Centre said, “Since 2009, the scientists of the ZSI in collaboration with other institutes have been updating the Indian amphibian checklist periodically. In 2009, the total number of species listed was 284. Among the amphibians listed, 19 species are treated as critically endangered and 33 species as endangered, Mr.Kulkarni said, noting that the list describes 19% of amphibians as data deficient species and 39% as not assessed by the IUCN. It is high time that we assess the IUCN status for the Indian ‘not assessed’ amphibians (169 species) based on species-specific field exploration,” said the conservationist, who conducts studies along the Mahadayi of the Western Ghats. A maiden Test series triumph in Australia saw both the Indian team and its skipper ViratKohli consolidate their positions in the latest ICC Test rankings released today. India, with 116 points, stayed as the No. 1 ranked Test team. Kohli with 922 points maintains his top position. New Zealand skipper Kane Williamson with 897 points ranked second. CheteshwarPujara after his dream series Down Under is ranked third among the batsmen while young turkRishabh Pant has entered the top 20 with a career-best 17th rank. In the bowler's list, KagisoRabada still topped the chart while RavichandranAshwin and RavindraJadeja are the best-ranked Indians at fifth and ninth place respectively.